Walk over weigh (WOW) technology has been around for a while now but is only recently sneaking its way into non-corporate systems. Given the highly variable climate of western Queensland though, the implications of getting real time data could have big benefits such as – the potential to turn off stock sooner, conserve pasture or identify the need to supplement far before visual signs of condition loss. To test out this theory, the GrazingFutures project has invested in a WOW system. 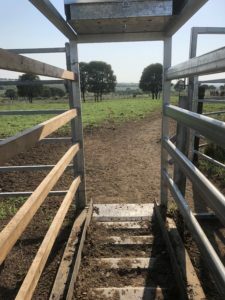 It is initially being housed at Echo Hills – located between Roma and Injune – with assistance from livestock managers Anna and Anthony Dunn. We have a million questions to test but we will start with looking at simply how the real time data affects the timeliness and accuracy of decisions made for a particular mob destined for turn off around April 2019.
and the final report with scenarios of what it might have looked like without the WOW data – did it save money, make money or cost money? So follow the Queensland Agriculture facebook page to see updates as they come or check back in to this page and look in the Publications section below. If you have questions about WOW that you want answered or if you want more information, please get in touch! This project is only possible with help from Department of Agriculture and Fisheries, Natural Resource Management groups, Tropical Beef Technology Services, ConnectAg and Echo Hills. It is primarily lead by the GrazingFutures project which is a Queensland Government initiative helping Queensland graziers to improve drought and business resilience. Keep an eye and ear out here for links to videos, updates, reports and more from the guys at Echo Hills and the GrazingFutures team!